Those Germans knew what they were doing when they brewed this up. For my 24th birthday, while I was still living in Italy, a few friends and I went on a roadtrip to Munich. 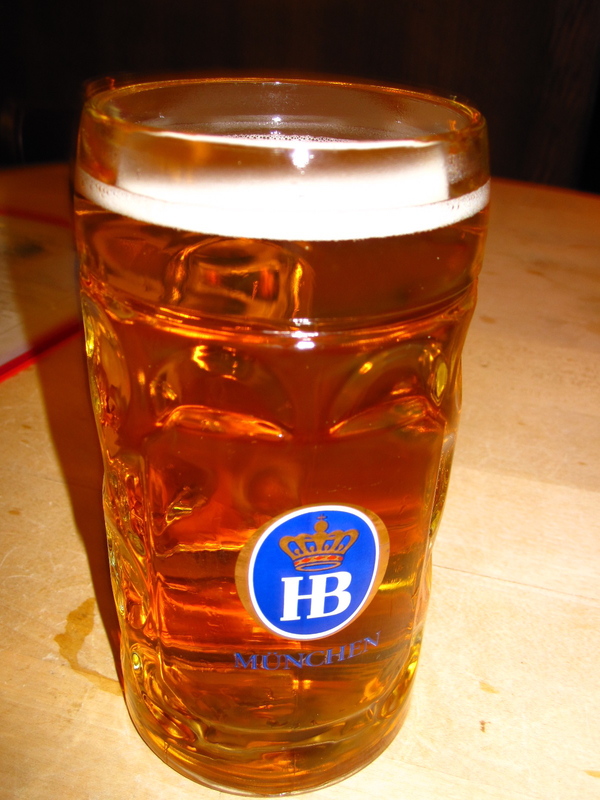 My birthday, which falls on the first week of October, also happens to coincide with the last week of the mother of all beer fests, Oktoberfest. Five of us loaded up into a van and drove the 7 hours overnight from Florence to Munich. When we got there, we spent three days drinking delicious German beer and eating nothing but pretzels, sausages and all sorts of other German carnival food. Needless to say, it was a pretty fantastic birthday. I was sort of indifferent about German culture and food before going, but after those three stein-swinging, ein-prosit-singing, schnitzel-munching days, I became a fan of all things German. 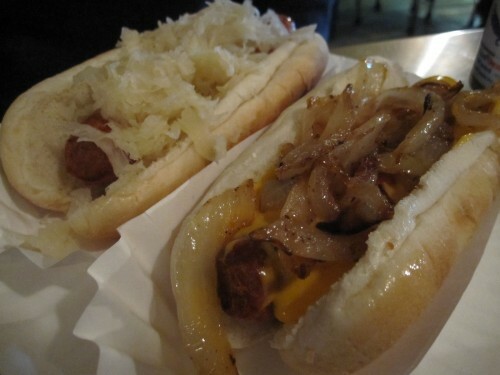 So this Friday, when Flaneur suggested we go to Loreley, a Lower East Side German restaurant and beergarden, I was all for it. Loreley has a full menu of German eats and brews, and thankfully, lots of English explanations of what all the German means. Afterall, I do not sprechen sie deutch. 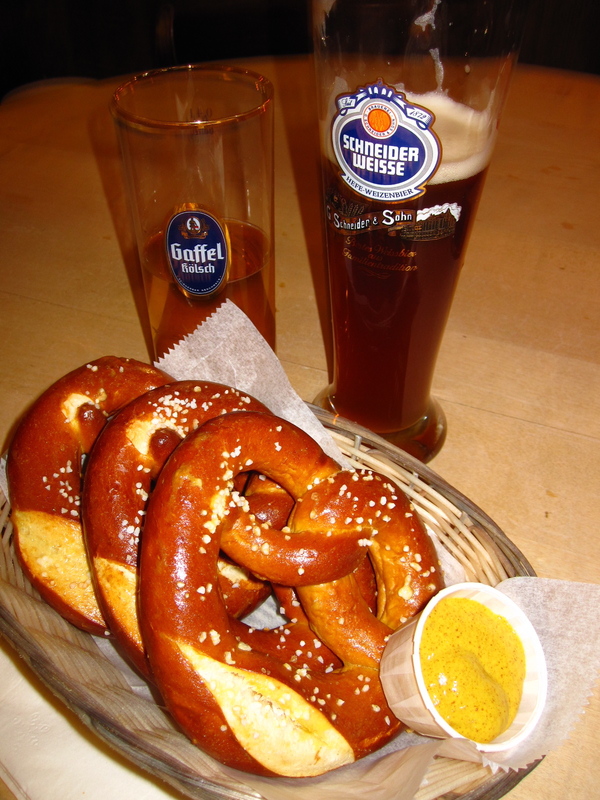 We started off with Drei echte Laugenbretzeln mit Senf which is German for uber tasty, fresh-out-of-the-oven warm and delicious pretzels with a side of spicy, golden mustard. And because it was Friday and time to unwind, we got beers to wash down our bretzelns. Gaffel Kölsch, a Loreley specialty ale from Cologne for Flaneur, and a Schneider Weisse Original, what the menu said was the “Queen of all beers,” for me. Drinking good beer in big tall glasses really makes you want to swear off drinking things like Bud Lite and really makes you wonder how in the world you were ever able to guzzle cheap beer out of plastic cups all through college. Or at least that’s the effect it had on me. After practically inhaling the pretzels and all but chugging the beers, we decided to go for round two. This time Flaneur ordered Hofbräu Bock, which is what we drank for those three days in Munich, and it even came in the same stein we had swung around so many times at those long communal tables of Oktoberfest. Mulled wine and bratwurst.... JA! I on the other hand, strayed from the beers and ordered a winter time traditional German drink, Glühwein, or mulled wine. Seeing as how New York had gotten pounded by snow the past couple of days, it just made sense to order something that menu specifically said was “perfect for cold days.” And when it came, the warm aroma of cinnamon and nutmeg wafting in the air made me almost forget that I was in the city and not sitting around a fireplace in a cozy German cottage. Mulled wine for some reason makes me think of cottages, fireplaces, and inexplicably, elves. There were none here, but I’m just saying. 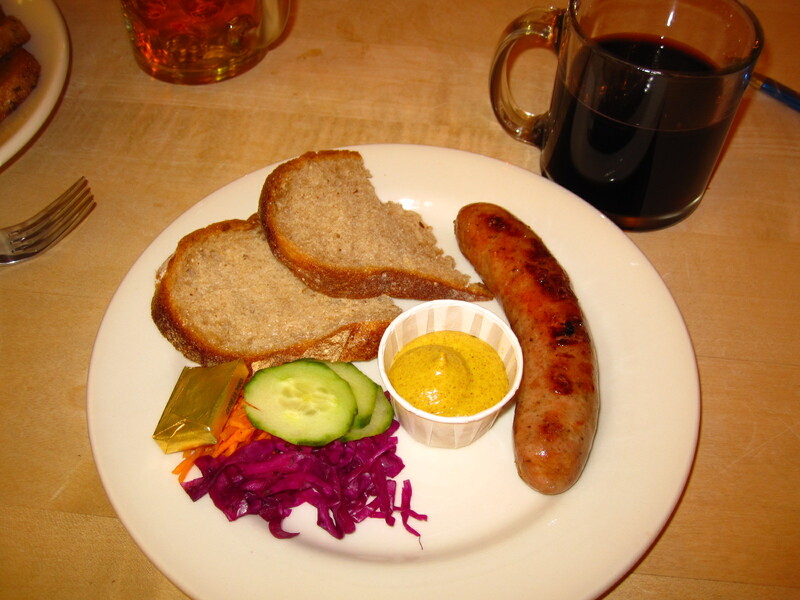 To go with our drinks we ordered another appetizer, Bratwurst mit Brot, a juicy bratwurst sausage with rye bread and the same spicy yellow mustard that had come with the pretzels. After we finished, full, toasty and warm, we braced ourselves for the cold street again as we put all of our layers back on —the scarves, hats and coats. It was a ways away but I started to wonder if it’s too early to start thinking about a possible birthday in Munich again. I keep a running list, an actual collection of names written on a notepad, of places around the city I want to go to. Sometimes, names on the list are just eateries I want to try in general without any specific menu item in mind. 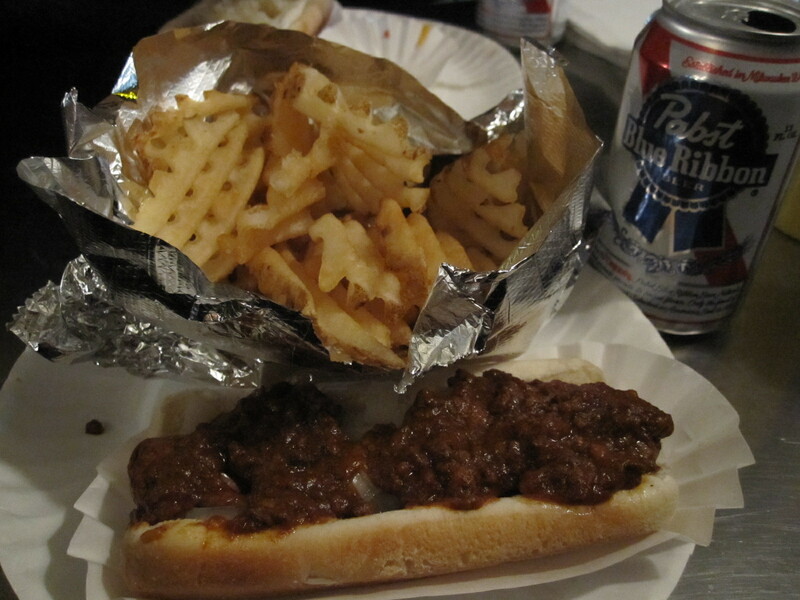 Those include recommendations from friends and coworkers or places popular for being New York landmarks. Others on my list are food spots I want to try for something in particular—empanadas here, cheesecake there, falafel somewhere else. Momofuku, in all its different forms, had been on my list since I first moved to New York, but it wasn’t until last week when I read about Crack Pie at Momofuku’s Milk Bar (the sweet shop and bakery in the bunch) that it got immediately bumped up the list and into the “places-I-have-to-try-as-soon-as-humanly-possible” category. No actual crack was used in the baking of these addictive pies. At least I don't think. 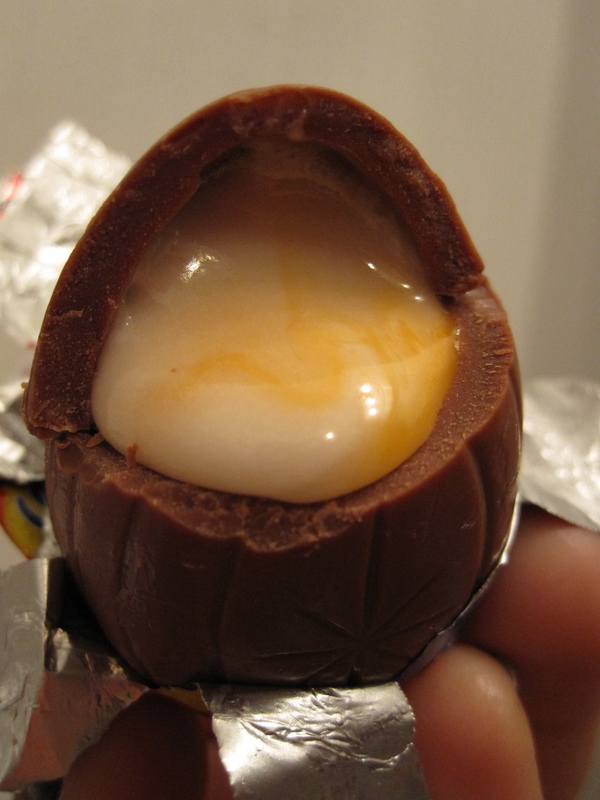 Gooey butter filling? What does that even mean? There’s only one way to find out. 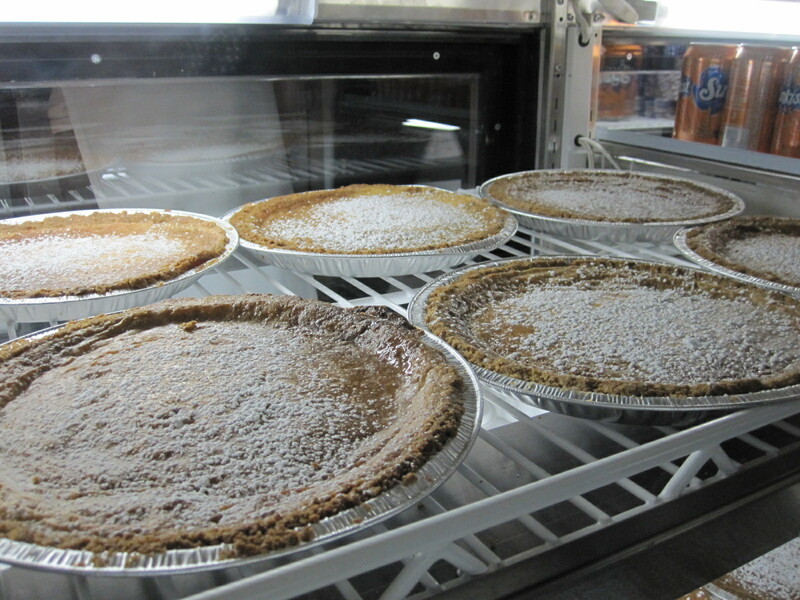 A note of caution here: Friday night, which is when I showed up at Milk Bar ready for some crack (pie), is probably not the best time to go if you’re in a hurry, if you’re impatient, or if you think you can just pop in and grab a quick slice of pie. 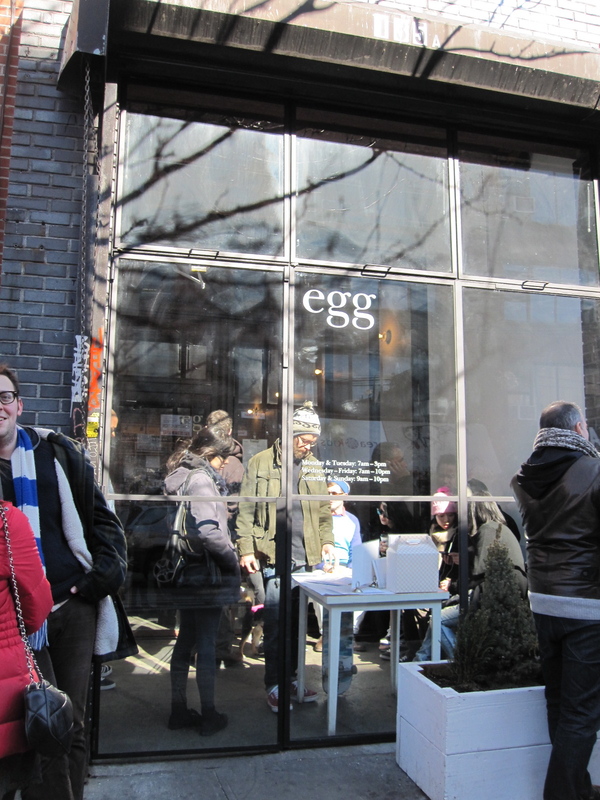 Every last bit of standing room was taken as people jammed in and inched uncomfortably close to each other in an effort to get just that much closer to the counter where they could order. After the waiting, the overall invasion of personal space, and the deliberating over what to get and how many of each thing was socially acceptable to order, I was ready to see what all the fuss was about. I kept it simple and got what I came for: Crack Pie. So finally, there it was, sitting in a white plastic to-go container, the much-anticipated Crack Pie. It looked simple, just a thin slice, nothing monstrous, with a flat surface and some confectioner’s sugar sprinkled on top. 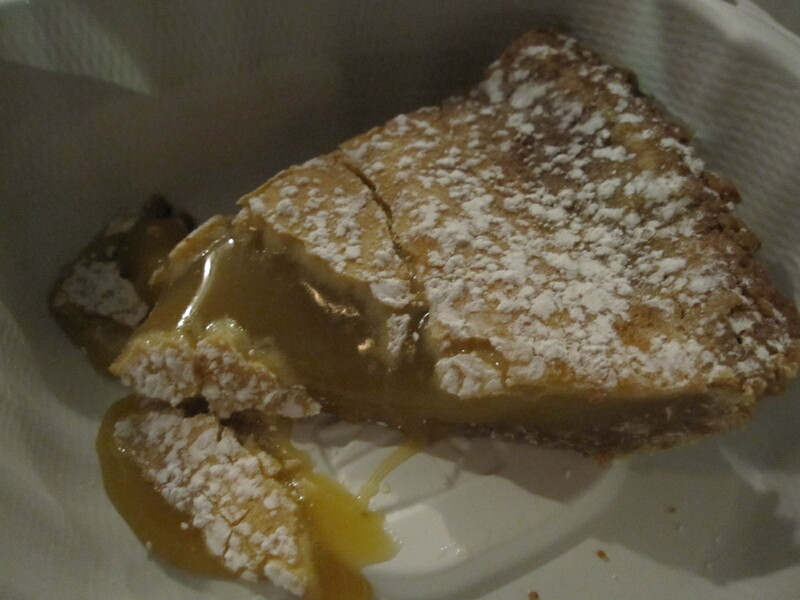 But the second I dug into it with the edge of my fork, the world basically melted away and all that was left was me, the Crack Pie and the delicious golden ooze of caramel-like buttery goodness that slowly leaked out of the slice. In my mouth the sticky, sweet filling of the pie mixed with the crunchy, granola-like crust to make for a complete mind-altering experience. It all made sense. 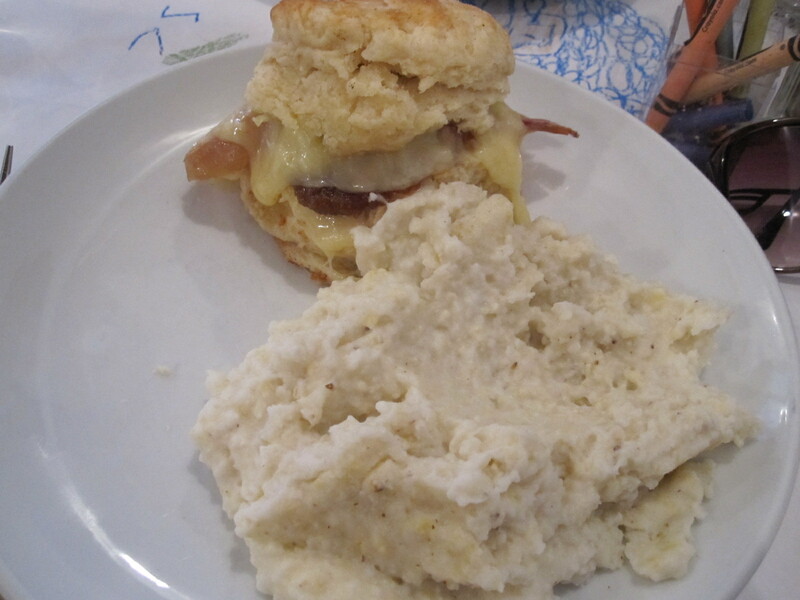 This unassuming marvel of a baked good was very much so appropriately named. After just the first bite I wanted more. I wanted a whole pie actually, but at a whopping, only-in-New-York $44 a pie, I had to settle for the one slice I was quickly devouring. Now as I sit here writing this, practically salivating as I read it back to myself while obsessively reliving that magic pie experience in my head, I get the distinct feeling that I might be having withdrawal symptoms. And as any crack head will tell you, the only way to satisfy a craving is to have more crack (pie). Final note: So you’ve read this and now you’re kind of twitchy, your palms are sweating, and you can’t stop thinking about crack pie. 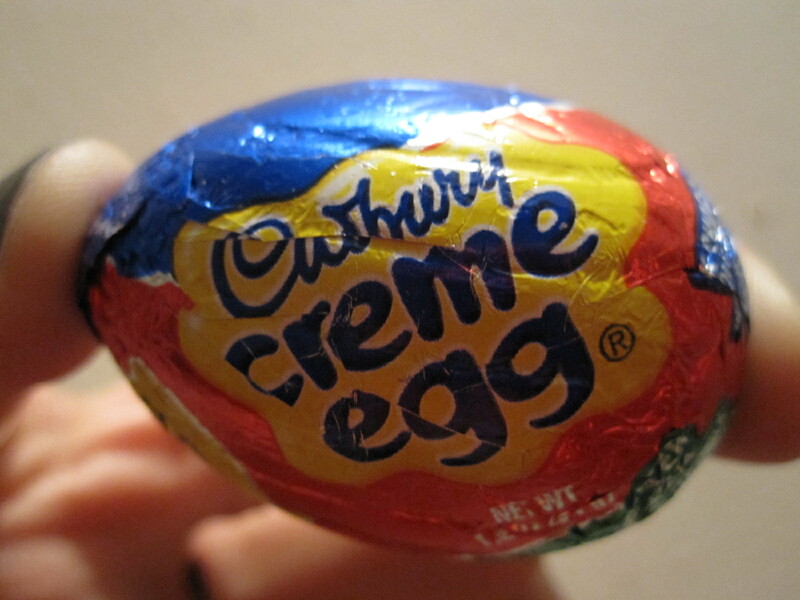 Well, don’t worry, as your enabler of all things fatty, I have the thing to set you right. For those of you outside of New York or those of you willing to try your hand at homemade crack pie, check out the recipe here. And if anyone need’s a taster for their crack pie, you know where to find me. 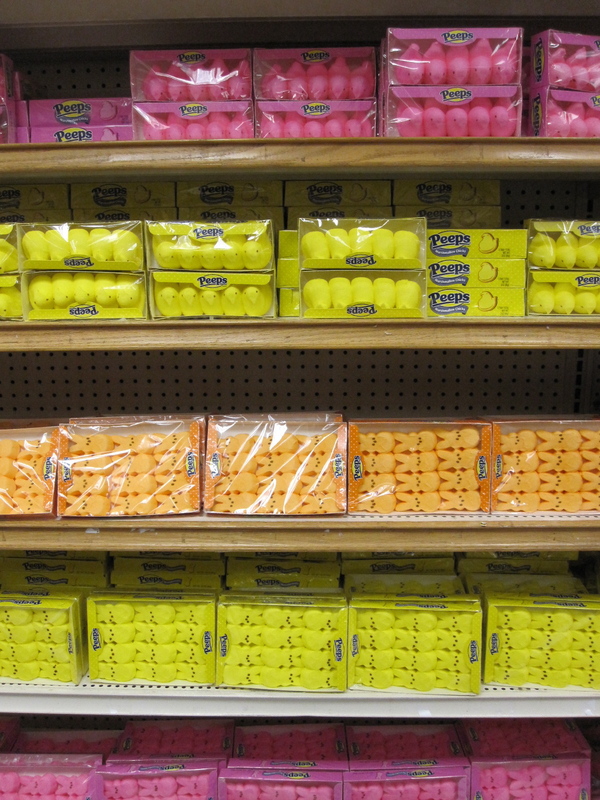 Last week, as people celebrated Mardi Gras and the end of the Carnival period before the beginning of Lent, I had a brief moment of panic. Oh no! 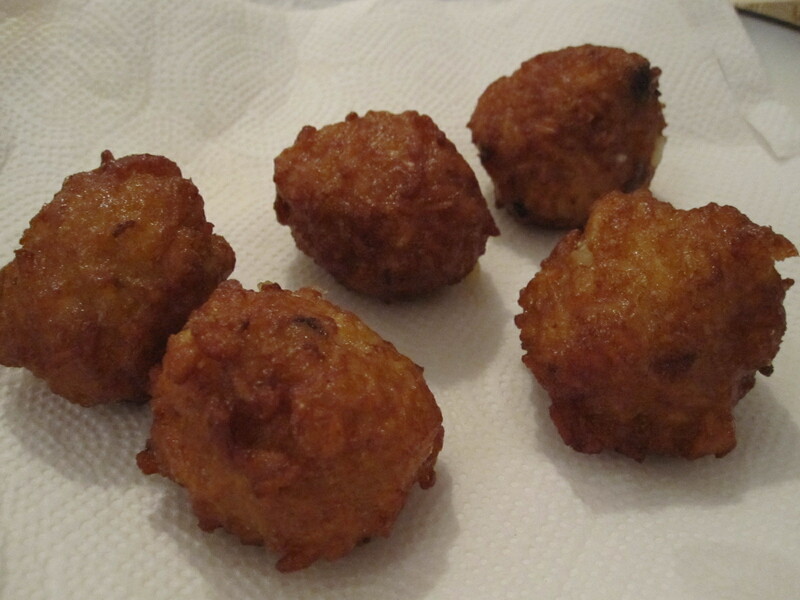 I’m missing frittelle di riso this year! 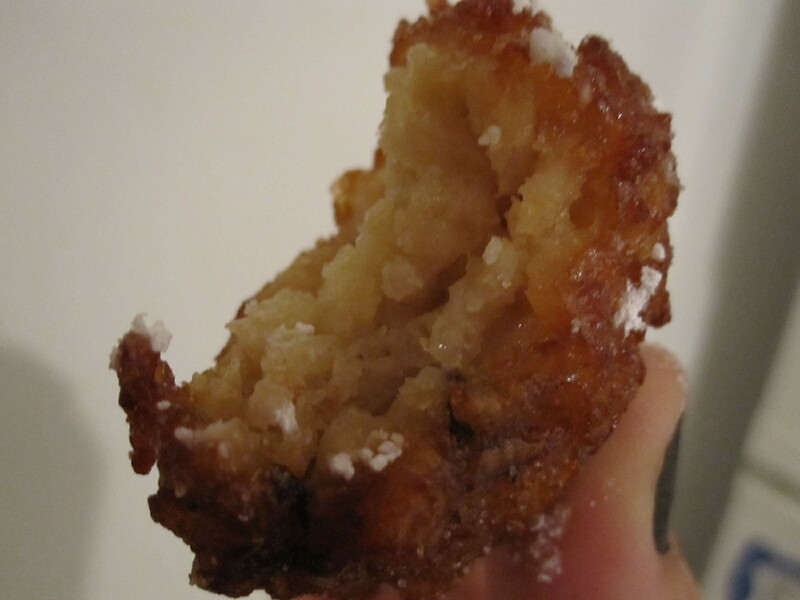 Frittelle, sugar dusted rice fritters, had been my favorite Carnival-time Tuscan treat. When I realized that this year I wouldn’t be a few minutes away from the nearest bakery selling them I was struck with nostalgia for my days in Florence. They were available at most bakeries and cafes around the city, from about February till April, but my favorite ones were found just a couple of blocks up on the street I lived on. And now, with an ocean between us, I’d have to miss them. But wait! Why don’t I just make them? 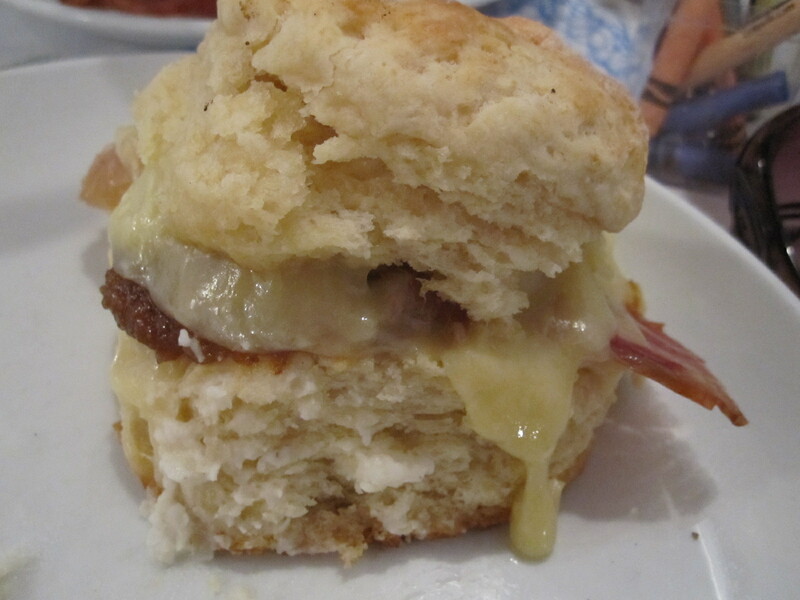 So I Googled a recipe, translated it and recruited Flaneur, my very own in-house Tuscan, to help me make this favorite Italian fried treat of mine. Rice mix ready for frying. We let the rice mix sit for 15 minutes and in the meantime got the oil for frying ready. We used a standard pot filled with a few inches worth of canola oil. 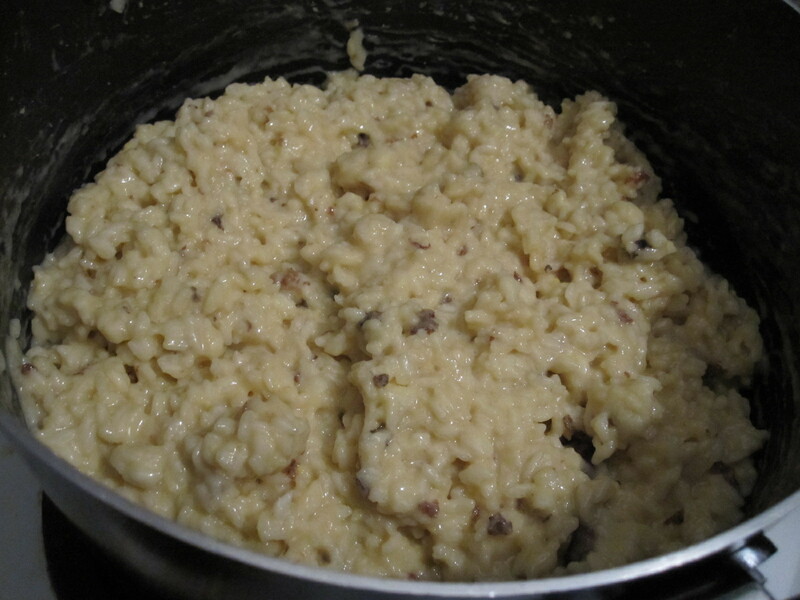 Once 15 minutes had passed and the oil was hot (you can tell because it starts to make hissing, popping noises) we spooned out golfball-sized chunks of rice and threw them in the oil. Takin' a dip in the hot oil. 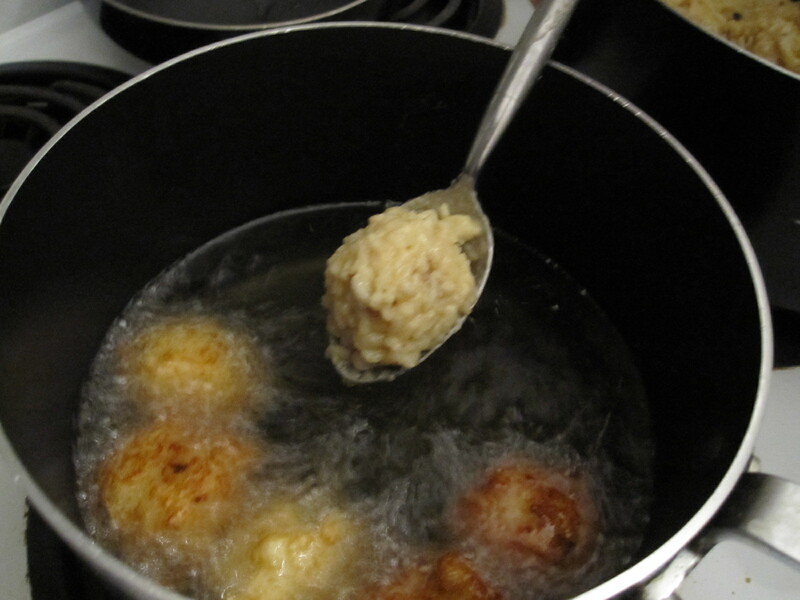 We left the rice balls in the oil until they were a warm, golden brown, before taking them out and replacing them with new ones. They were pretty oily so we set them on paper towels to soak some of the oil out. 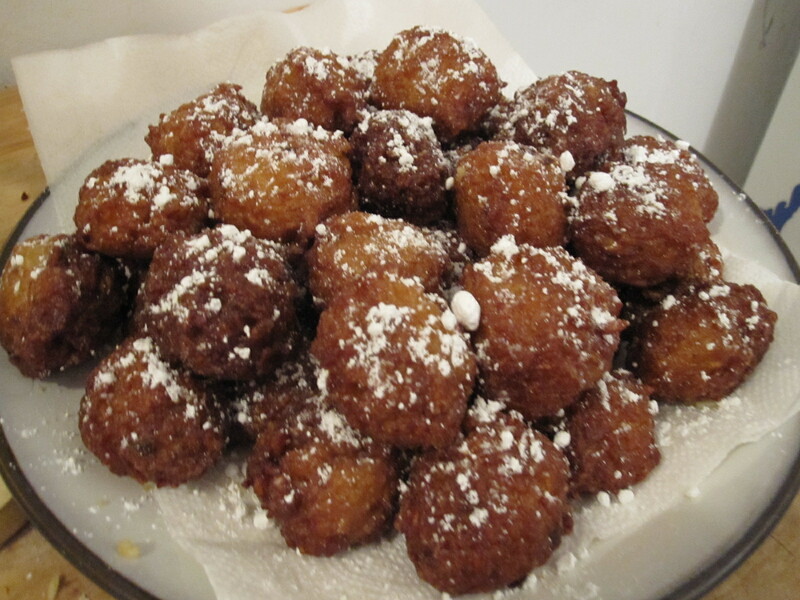 Finally, once they were all out of the oil, we sprinkled them with confectioner’s sugar and sat down to enjoy our fresh, homemade frittelle di riso. I’ll be completely honest, our technique could use a tweak here or there but in the end, our frittelle were delicious just the same and maybe even more enjoyable since we made them ourselves. 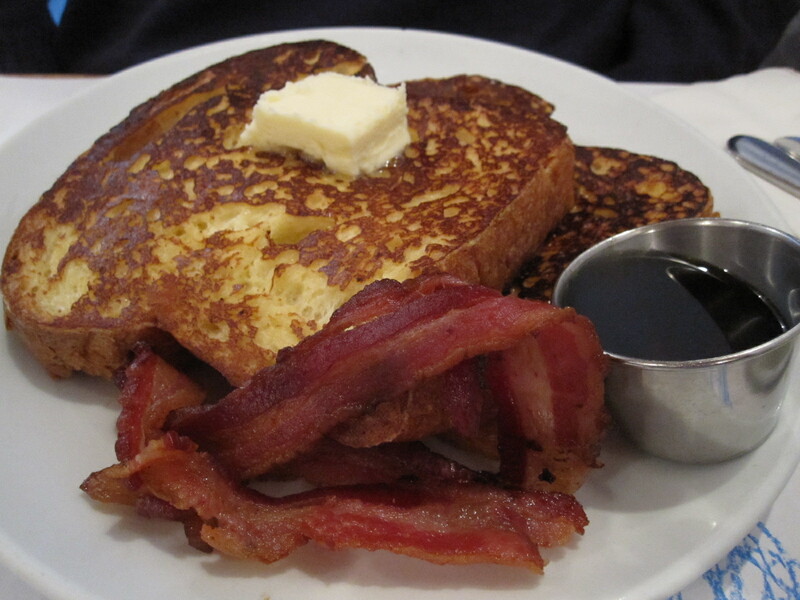 You can’t go wrong with something fried and sprinkled with sugar. Now that I have a brand-spankin’-new paint kit I paint them too! In an effort to resurrect my old artsy side, Flaneur got me a set of paints, brushes and canvas boards for Valentine’s Day. 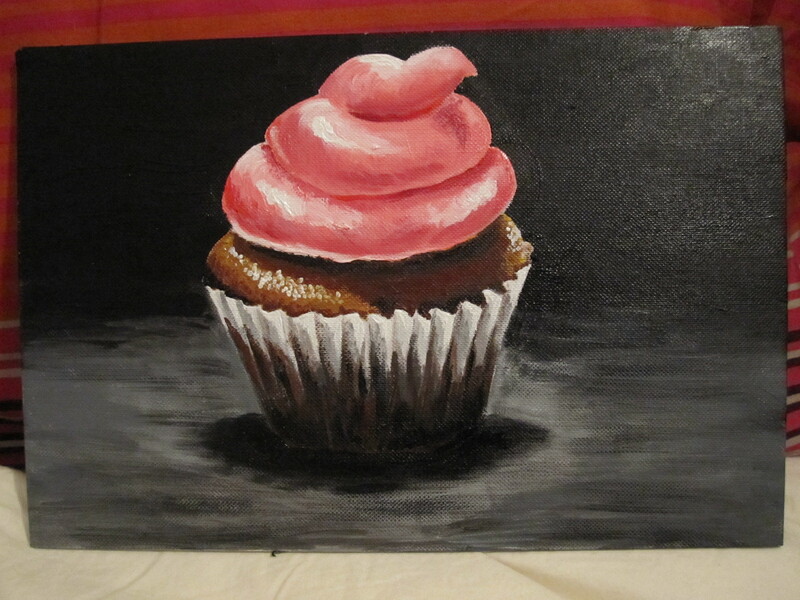 Although we joked about having a Titanic moment (sans gigantic diamond) I decided the best and most obvious thing for me to paint would be food, and what better subject than cupcakes! This one is a copy of a painting by Jelaine Faunce. I thought it was better to do it this way because really, there’s no way I could stare at a cupcake for hours and not eat it. Painting is WAY harder than I had remembered.